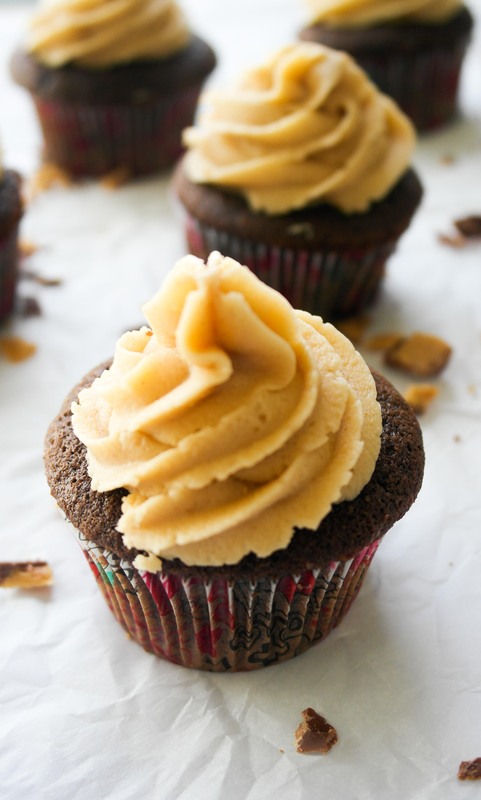 This delicious, creamy peanut butter frosting is stuffed full with marshmallow fluff and copious amounts of peanut butter. It’s delicious alone or with cake, you decide. 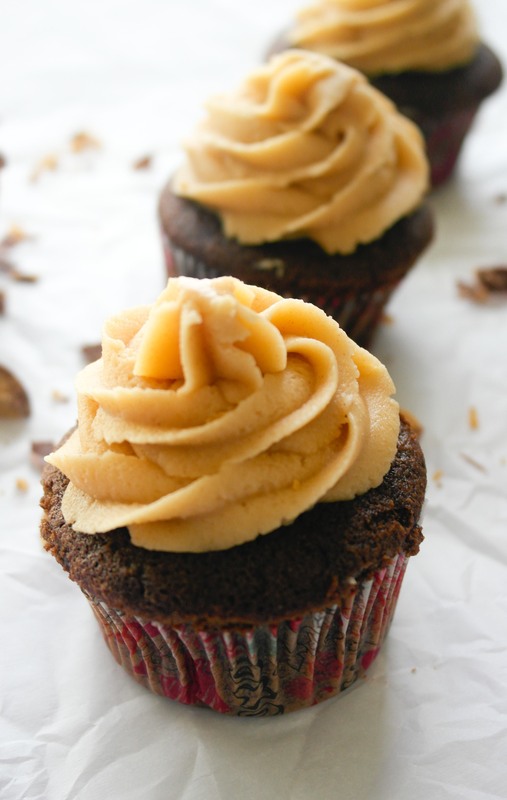 Ah, peanut butter frosting. I should just call it “peanut butter fluffy fudge thing to eat” because it’s amazing paired with or without a cake. In fact, I ditched the cupcake halfway through and just scraped off the frosting, which probably wasn’t a good sign for the cupcake. A quick note on the cupcake and why I ditched it/took pictures of it: this cupcake was an experimental chocolate cupcake. I’m in the process of perfecting a chocolate cake/cupcake recipe, and this was one such step in the process. Unfortunately for the cupcake, they left much to be desired. But the frosting, oh the frosting. The secret is marshmallow fluff. A big, sticky scoop of marshmallow fluff. For me, frostings are about throwing a bit of this and that into it and then adding whatever to adjust the taste and consistency to what I like it. Usually I don’t use a recipe, but thankfully I did keep track of what I did this time. A hint: if you get done with my directions and you’re like, I want a more peanut butter taste, by all means, add more peanut butter. Frosting is extremely flexible and I’m constantly adding, adjusting and tasting. That’s why I love making frosting so much. 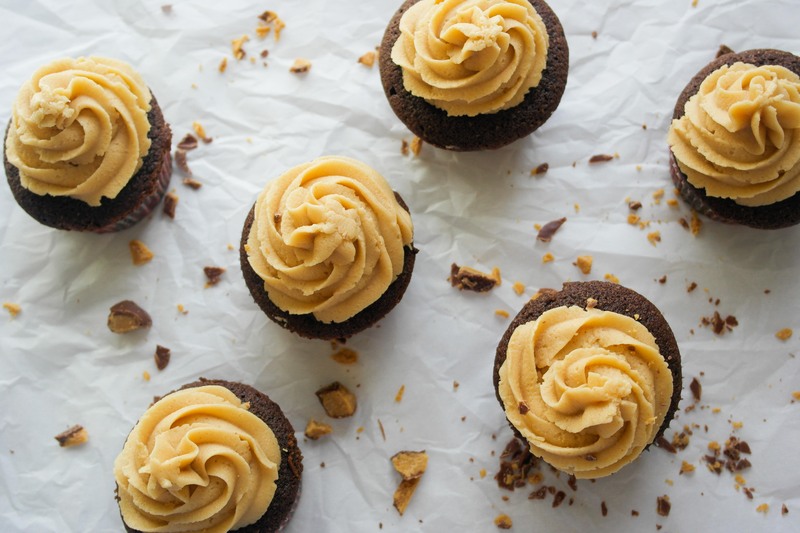 This delicious, creamy frosting is stuffed full with marshmallow fluff and copious amounts of peanut butter. It’s delicious alone or with cake, you decide. Cream the marshmallow creme and peanut butter. Continuing adding powdered sugar, peanut butter or marshmallow creme until at your desired taste and consistency. Love the freedom to add what ever to ones taste. Thanks, Max! I appreciate the feedback. I am baking a lot of boozy cupcakes for different parties and events. This is the perfect frosting for my Buttershots schnapps cakes. I fill the cakes with butterscotch pudding/peanut butter shots and they are a huge hit. The fluff is so forgiving and tastes much better than just a plain old buttercream. Thanks for the tip. I’m making 140 today!!! Can you make this with regular marshmellow’s if you don’t have marshmellow cream? Hi Shawnee, I wouldn’t recommend doing so. Thanks!